Jonathan Quick is finally getting some love from McFarlane Toys–and all he had to do was lead the league in shutouts, win the Stanley Cup AND be named the Final’s Most Valuable Player. In December, Quick will have an exclusive 6-inch SportsPick figure released in his likeness by McFarlane Toys. 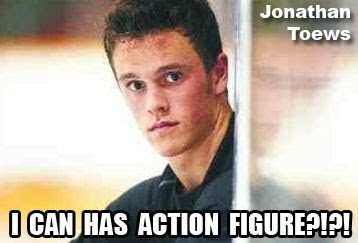 The figure will feature Quick in the “glove save” pose and will be in the Los Angeles Kings’ home uniform. 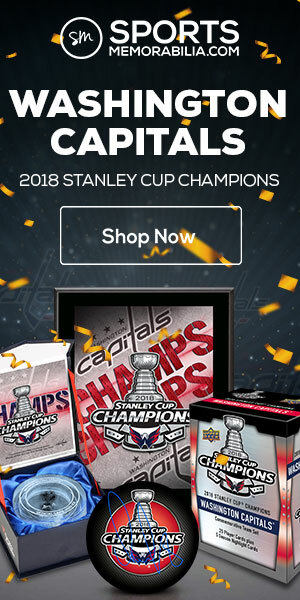 It will come packaged with a mini Stanley Cup. An exclusive figure of Quick is a great idea–but one that does not go far enough. 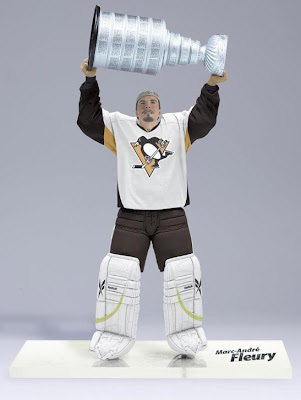 Why not include a mini Conn Smythe Trophy as well? Or how about a net? Longtime collectors of NHL SportsPicks figures will remember back when the goalies actually included nets and a water bottle. Unfortunately, the nets (and bottle) no longer come with goalie figures. Sure, including a Conn Smythe Trophy and net would undoubtedly raise the production costs of the figure, and thus the price. But most collectors would not mind paying a few dollars more for an exclusive figure that feels more like an exclusive and less like a repaint of a Marty Turco. The goalie pads might be different, but the body of the upcoming Jonathan Quick figure (left) appears to be a repaint of an earlier figure like Marty Turco. That’s OK, but why not include a Conn Smythe Trophy and a net? 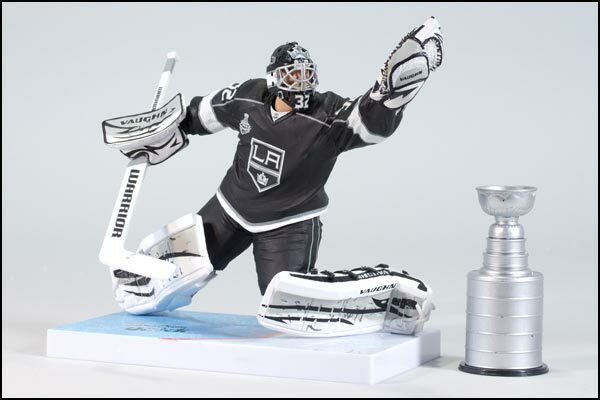 Collectors in the United States can purchase the Jonathan Quick figure through the Spawn Online Store. In Canada, the figure is exclusive to Grosnor Distribution. Additionally, fans in L.A. can get this figure in the Kings’ team store–assuming the season resumes by December. In the meantime, I will have to evict a less-worthy hockey figure off my bookshelf to make room for this one. Photos courtesy of McFarlane Toys. This is AWESOME!!! 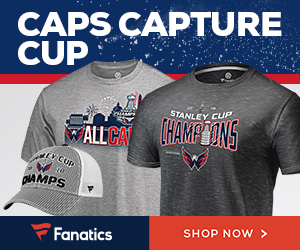 To have Quick’s as a figure with the cup!